Motorola has beefed up its already rugged handset joining forces with digger firm come tough gadget leaders JCB to officially unveil the limited edition Motorola Defy+ JCB. 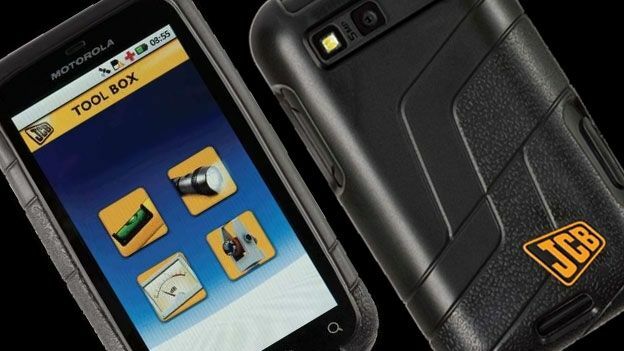 Further protecting the Motorola Defy+ against hardened knocks, drops and splashes the new limited edition JCB model is to add a host of new performance features whilst the patented visco-elastic protective sleeve ensures your device can stand up to anything that is thrown its way. Hosting the same internal spec as the standard Motorola Defy+ the Defy+ JCB packs a 1GHz single-core processor with 2GB of internal storage expandable via microSD card. A 3.7-inch touchscreen display features on the fore with Corning Gorilla Glass ensuring the handset is further protected against knocks. Google's Android 2.3 Gingerbread OS powers the device with a 5-megapixel snapper landing on the rear. Adding to the JCB's abilities the limited edition handset will come pre-loaded with a selection of workplace inspired applications with a spirit level feature joined by s theodolite, decibel meter and recorder, torch, unit converter, calculator and DIY store locator. Walkie-talkie inspired push-to-talk functionality completes the JCB's bag of tricks. Available now the limited edition Motorola Defy+ JCB, which comes boxed with a car changer and extra long curled charging cable, will set wannabe owners back £259.99. What do you make of the limited edition Motorola Defy+ JCB handset, sleek looking life proof device or a sub-par rugged handset that has passed up sturdiness for stylishness? Let us know via the comments box below.